Sometimes the Japanese eShop line-ups, particularly with the Virtual Console, can provide a little advance warning on what's heading to the service in the West. We hope that's the case with the latest arrivals on the New 3DS VC in Nintendo's homeland, as it includes a couple of classics. One title heading to Japan this week is Kirby's Dream Course, which has already been confirmed for the 9th June European Nintendo Download Update. That gives some optimism for the other two SNES titles heading to Japan this week, especially as they're also releases we've previously seen on the Wii U Virtual Console. This time up Japanese gamers will have the chance to play The Legend of the Mystical Ninja and Super Street Fighter II: The New Challengers. It's worth noting that Game Boy title Mystical Ninja Starring Goemon has long been available on the standard 3DS Virtual Console, but in our view it isn't a patch on the SNES title. Would you pick any of these up on the New 3DS if they came to the West? Let us know. Yay, Street Fighter 2 with no multiplayer. Capcom is the only developer supporting Wii U and 3DS: Ace Attorney 6 is coming to 3DS, I think Resident Evil 4 is the only Wii game (not published by Nintendo) to appear on the Wii U eShop and now Super Street Fighter II on New 3DS. Anyway, I'm not buying the same ROMs twice so unless Nintendo implements cross-buy I won't get any more games. Keep em coming. I've always wanted to legally play SNES games on the go. @Ralizah Emulation is legal. Piracy isn't. The Game Boy game on the eShop is pretty much the worst entry in this long-running series, though. Yeah that's great and all but until they add multiplayer I'm very reluctant to download any of the SNES games. I've seen this misguided belief on this website a few times recently. Emulators may be legal, but Roms aren't as they are unauthorized distribution of copyrighted code. Accessing games in any way which is not officially authorized by the developer/publisher is illegal; you can't circumnavigate this with the "I own a physical copy" argument either. I say this as someone who uses emulators (and has done for over 15 years - my first experience with a Rom was playing Pokemon Red off of a floppy disk way back in 1999 during the gap between the US and UK release of the games) - they are technically illegal. I'm sure there will be an argument against me that I'm wrong because "x, y and z" but if people stopped believing hearsay they'd know that I (and the Berne Convention) are right on this one. Kinda odd they confirm Turbo and Super were coming to 3DS but start with Super first. Haven't really bothered with 3DS SNES games and don't think I'll start now. A cross buy system would make it a lot more appealing. @VanillaLake I wouldn't say Capcom have really supported Wii U. They only made 2 Wii U retail games, Monster Hunter 3 Ultimate and Resident Evil: Revelations. Both were 3DS ports and both released over 3 years ago. @Moon Yeah it definitely hurts to have no multiplayer. Too bad no local multiplayer. Remember that SEGA Street Fighter II game for the Wii VC ?? They put a little extra special love in that version as it had online multiplayer implemented into it. It's still one of the few VC games they altered to do something like that, if not the only one. A little extra love like that^ would go a long way on a SFII game on 3DS. Tough the Turbo version is the best in my opinion and the snes Goemon is alright its a fun co op game but sadly it doesnt have that and its a really short game so pass on both of them. What about emulation used for piracy then? Or piracy as a way to emulate software? Or piracy to emulate pirated games that were bootlegged to begin with? Sorry for this tired variation of the "Bread, eggs, breaded eggs" joke. @SLIGEACH_EIRE Still, they are the only developer that supported them at any level. @bezerker99 Right, excluding Sega's 3D classics, the rest of the Virtual Console on both Wii U and 3DS is shameful. On PS4, PS2 games are enhanced, and Xbox One's Rare Replay has games upscaled to 1080p and improved frame rate. On Wii U and 3DS, basically all the games are not only untouched ROMs, but have some features removed (multiplayer, online, ghost data, etc.). Not only that, but they are more expensive on Nintendo consoles and there is no cross-buy option except for one single game. @VanillaLake No, Ubisoft would easily get that title. While the prospect of buying a Street Fighter II game with no multiplayer is downright appalling, I feel like I'm destined to own every port, every version of this. So it's only a matter of time. What baffles me is why they can't use the Genesis version and use its XBAND support for online multiplayer like they did on the Wii VC. Oh yeah, Nintendo seems to be allergic to the Genesis this generation. I saw street fighter coming to 3ds VC and I smiled, then I saw coming to japan and I got sad. 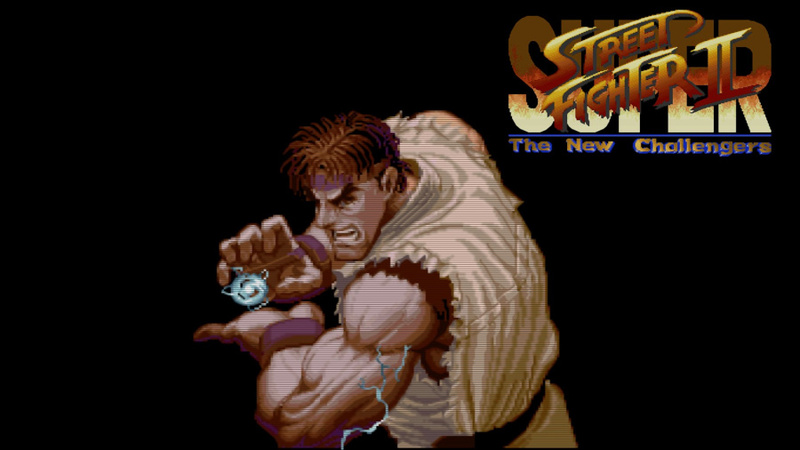 Yay, more Street Fighter 2, as if nobody owns it elsewhere on Nintendo consoles. Capcom needs to throw us a few other games in their backlog of fighters. Actually, they just need to sell us more games in general. Great another SNES game that I can't get. The new 3ds simply doesn't offer a decent upgrade incentive, I can get the cpp and nfc reader and basically have a new 3ds (glasses so face tracking 3D is not very good). Besides Nintendo got Pokemon trading on VC yet cannot do SNES multiplayer? How many people would play multiplayer anyway? Those who would will probably prefer Super Street Fighter IV than SSFII if they could. @Bass_X0 If people can play multiplayer on something like Steel Diver I don't see why they couldn't implement it for SSFII. Can't know how many people will do anything if the service isn't offered. @SmaMan Sega hasn't support Genesis VC games for 3DS yet so you likely won't see that coming. Also due to Nintendo dropping WiFi support from the Wii, they close the online server for that game (Super Street Fighter II Genesis port) already so you can't play it online anymore. It'll be nice if they allow multiplayer through local WiFi with the VC games, that would at least make them a bit valuable to get. @retro_player_22 That's not the point though. The netcode is pretty much there already in the Genesis version thanks to it supporting XBAND modems back in the day. They used it in the Wii version, and it wouldn't be too hard to getting it running on the 3DS. But like I said, NoA is allergic to the Genesis in this generation. @SmaMan Wouldn't that be the same for the Super NES version too? If that's the case I don't see why they couldn't just implement that for the Super NES version instead. Super Street Fighter II SNES like the Genesis version also support XBAND as well.